I`m painting fantasy and science fiction minis since approximatly 6 years. I started with simple techniques like drybrushing and washes and was quite happy to produce nice minis for gaming, but then I entered the coolminiornot site and have seen all those fantastic paintjobs there. I couldn`t believe what I saw and was totally fascinated. Since then I had the wish to paint as good as all those big painting stars at cmon. A long and painful way began. It has been hard to get any information about techniques, tipps and tricks. So the first 4 years of trying to become a better painter I was forced to find out how it works by myself. Then I met Roman and a lot of other great painter and since 2 years I make constantly progress because of the great support of all my friends. Thanks to you all at this opportunity :-) Of course, Iself also help other painter to make constantly progress. I call it the "circle of support". Commissioned work for Miniaturenland. I fell in love from the first moment when I saw this sculpt. When I held it in my hands and painted it, I could really convince myself that the sculpt is pure perfection. At this opportunity I would like to recommend the sculpts by Jeff Grace (he is sculpting for Dark Sword Miniatures) because they are really breathtaking and perfect sculpted. Apart from that it is great fun to paint them because they are not as fine as the sculpts by Tom Meier and so even an unexperianced painter can handle them. I had a lot of fun painting this sculpt and would say that it is one of the greatest sculpts I ever painted. First I had a totally different vision of her but the customer wished strong colours and so I suggested a couple of colour schemes and the customer decided himself for the current one. To be honesty, there hasn`t been a real concept because the customer always wish that I only paint the sculpted bases and not more. Neverthless I had a couple of ideas. I wished to paint her decent and delicate and wanted to avoid bold colours. I went for a good contrast because she has to look good into a showcase. While painting I decided myself for a limited palette because I supposed that each additonal colour would destroy my colour scheme and I thought the blue/orange, warm/cold contrast is enough for making the sculpt look intresting. Because of the limited palette I asked the customer if he would allow me to glue some sand on the base because I could paint it in suitable colours then and so I didn`t had to paint the green gras which I didn`t like for the colour scheme. I exactly used the colours he recommended which are Chocolate Brown (VMC), Red Leather (VMC), Sunny Skintone (VMC) and White. Basecolour = Cadmio Skin (VGC), Midtones = 2nd base (Andrea Paints),Dark Fleshtone (VGC), Shadows = Burnt Umber (VMC), Storm Blue (VGC),Dark Fleshtone (VGC), Highlights = Light Flesh (VMC). Storm Blue (VGC) mixed with Cold Grey (VGC), shaded with Storm Blue, Dark Fleshtone (VGC), Red Leather (VMC) and Black. Lucy was a commissioned work for Fatalpersonality. The customer hasn`t much own wishes. He only wished that she will be blonde and look like an angel at her front. So I went for a kind of porcelain skin. 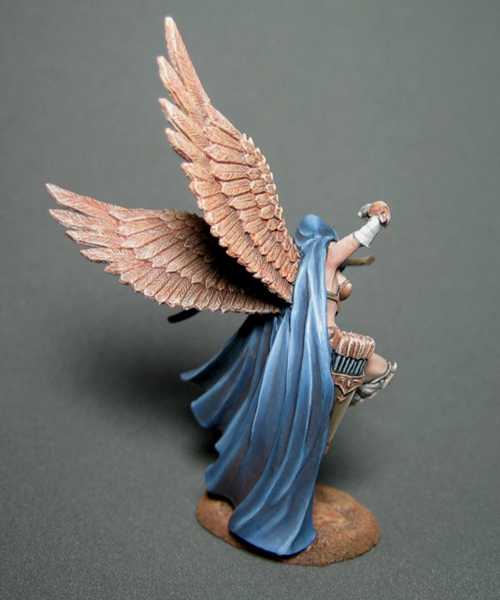 Because the miniature is a half angel/half demon I had the idea to use the theme for the base too. 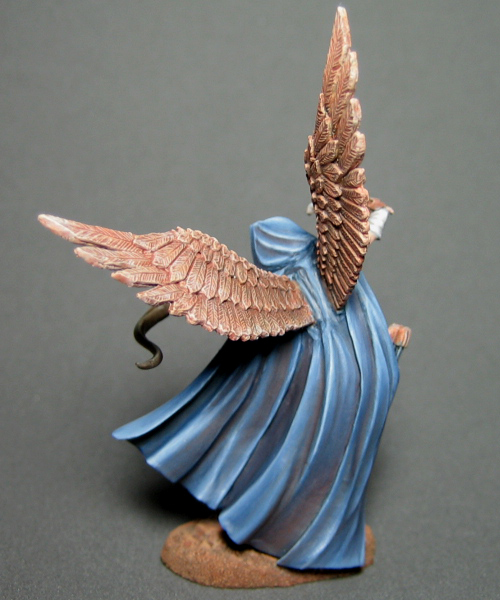 So I shared the base into two sides (heaven and hell) and also painted differentb osl`s. The orange light from the hell side and slightly yellowish light from the heavenside. In the midst I decided myself for white, zenithal light for to bring out well all details. All those different lights has been harder to paint then I supposed in the beginning. 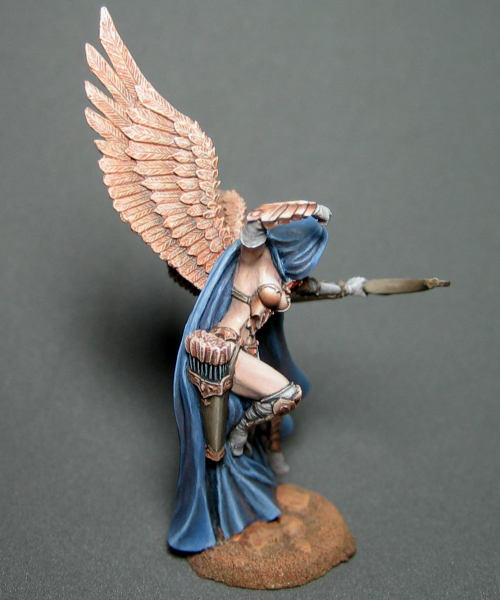 In the end she is also one of those slightly unfinished minis by me. Skintones: Basecolour = Pale Flesh (VGC), Midtones = Brown Rose (VMC), Dark Fleshtone (VGC), Shadows = Dark Fleshtone (VGC), Charred Brown (VGC), Storm Blue (VGC), Highlights = Light Flesh (VMC). I can only guess the working time but it was certainly far over 60 hours because I made a big mistake and used the tiny brushes still to often. This is the first real co - production by Jarhead and me. We started this project in December 2008 when he visited me. I already had started to paint Neo Pi but in boring colours and I also didn't get the atmosphere I wanted for the sculpt and wasn't quite happy with the paintjob. Jarhead asked if I would allow him to add a little bit colour to Neo Pi and I agreed. Sometimes his suggestions really sound strange (for example yellow highlights at the pink hair) but I agreed trustfully to all he wanted to try at Neo Pi. While Jarhead painted on Neo Pi I painted a little bit on his Nimue. Next morning at 10 o'clock am we stopped painting because Jarhead had to go home and travel back to Augsburg. Neo Pi has changed extremly because Jarhead brought her to live and added a lot of multicoloured shades and highlights. This has been the concept for Neo Pi and my part was to work it out all out clean and smooth. During the last 3 months I've tried to get it all smooth and it hasn't been easy but I also learnt a lot by painting this miniature. Since over one year Jarhead and I have a good contact and we exchange our experiances in painting. I was fascinated from his painting style from the first moment and he also has been intrested in my way of painting. We decided to learn from each other and so we started to explain the way we paint to each other and also practised. The goal of this cooperation was that I learn to paint like Jarhead and that Jarhead learns to paint like me. 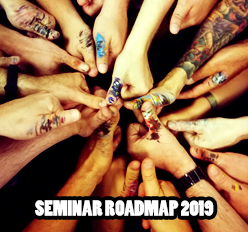 Jarhead already learnt his lessons and painted a huge amount of wonderful showcase level minis since then and Neo Pi has been the project where I had to learn to work with multicoloured shades. Up from now we decided to do more often such co - productions because it is great fun. I will keep Neo Pi by myself and also post her on coolminiornot but the next one we paint together is for Jarhead and he will post it and keep it for himself. We think that is a fair solution. The whole colourscheme, the painting on the base and the atmosphere was Jarhead's work and my part has been to work out all as good as possible. Of course I improvised a little bit but I really tried to combine both painting styles to one new and own style. I never would be brave enough to create such a colour scheme by my own and I'm pretty sure that I didn't would have got all those ideas. I guess Jarhead would rather die than to paint over 60 hours on a miniature and so we got it to combine the forces of two painters in one project. I think this kind of cooperation is more than inspiring. This version of Astrid has been painted for a friend. I intentionally decided myself for the comic style look. I felt inspired by the Version of Darkstar Astrid by Darkstar. 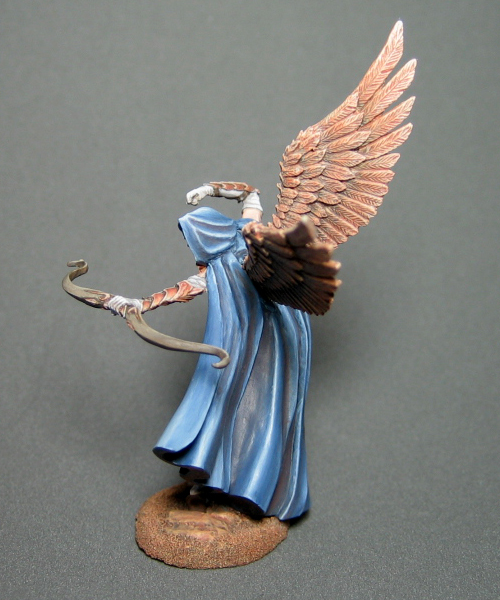 The highlights are painted with Ice Blue from Vallejo Game Color mixed with black, because highlighting of black works better with Ice Blue than with pure white. The Poledancer is one of my favorite sculpts, but she is also very hard to paint because she is so tiny. The pattern on the base shall be the reflection of laser light like you can see it in clubs. 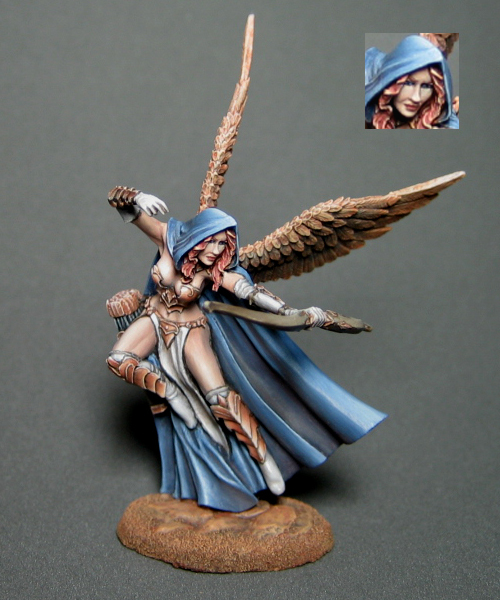 This one was a commissioned work for Assassin Miniatures. The osl was pretty hard to do especially because I also tried to do normal highlighting next to the osl. That has been a lot of input for the moment. I hope you like them and of course any kind of feedback is appreciated :-) I will also write tutorials for Massive Vodoo and I will start up with a blending tutorial. Blending Tutorial part 1: Blending, basic knowledge, to understand blending. Blending Tutorial part 2: Layering and how to use the ice palette (my special tool). I`m already try to get the first part of the tutorial finished and it will coming up soon :-) Please be patiently concerning part 2 and 3 because it is all a lot of work and time off is rare. One love - mini paint! Hey Yvonne what a start here! The thief of Hearts is also one of my favorities - espaccially the highlieghts on her breasts is really awesome - and im not saying that just because of i am a man ;) The Poledancer of course is my personal fav ;) I just love her Face - so lovely. Your painting style can really be called "high defnition"
Awesome stuff there! Am looking forward to seeing more of your work! That thiefes of heart is ... now imagine Kong jumping through big banana plantages... wow! Your skills are inhuman! Awesome work! And what a great introduction! Love to see your fantastic miniatures here. @Camelson: I`m glad you like them. I checked out your blog. Very cool minis there, thumbs up!!! @Count Zero: Lol, probably I will never paint a miniature you like more than the Poledancer I guess it is because of the poledancer`s "dress" lol. @Carl: Thanks :-) Now that I have learnt the wetbblending technique at Roman`s workshop I guess I will have more output soon. @Libero: Dankeschön :-) Fabrizio bist du das? @Troll: "Inhuman" Lol. I swear I`m not an alien and there is still a lot to learn, but thanks for your encouraging words. Tried to check out your gallery at cmon but it doesn`t work. You should try another photo hoster. @Sabine: Thanks :-) We decided to take another Avatar. I explain you "why" later. Really nice work. You have a very subtle and original style. Look forward to seeing more but don't eat too many of the guy's bananas. @Jim Johnston: Thanks for your comment :-) I often hear it that I shall have an own and subtle style but to be honest meantime I guess it is because of the photos. Actually nothing looks subtle at my minis if I look at them in my showcase (highlights popping out extremly although it is dark in my room). Yesterday a good friend of me showed me how to work at the photos for bringing out the contrast and the highlights more and that looks way better (and definitely less subtle) than the photos I posted. I have always taken the pictures for posting almost like they come from the chip of my camera and I only use one lamp for taking the photos and so the minis look subtle. I`m curious what you will say if I post my next mini with different photos :-) I`m afraid it will be like a hit in the face after seeing the pictures I posted until now,lol. I hope you will still like them.